Cafés in Helsinki are self-service (or at least, all the ones I frequented were). 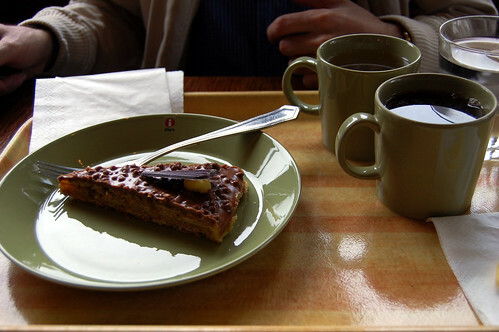 You take a tray, help yourself to the various savouries and cakes (and yes, you have to serve yourself the slice of cake), order drinks from the cashier and then pay and carry all your items to the table of your choice. Cafés in Helsinki serve what I call cold food. 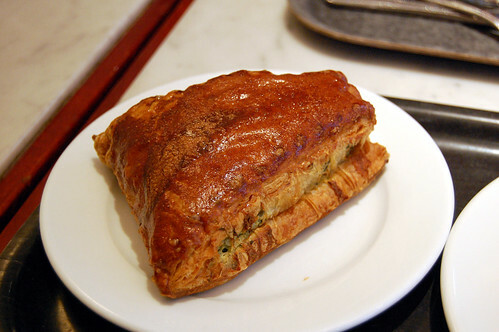 So, sandwiches, salads, pastries, cakes, quiches, tarts, etc. Cafés in Helsinki provide free tap water, from a tap! Glasses are stacked up by the tap and the nicer places provide a bucket of ice and/or a bowlful of lemon slices. Cafés in Helsinki are so nice! After our light seafood lunch on Saturday, I dragged Blai (who was quite tired from his work-filled week in Helsinki) to the Café Kappeli, housed in a a beautiful glass and ironwork building in the centre of the city. 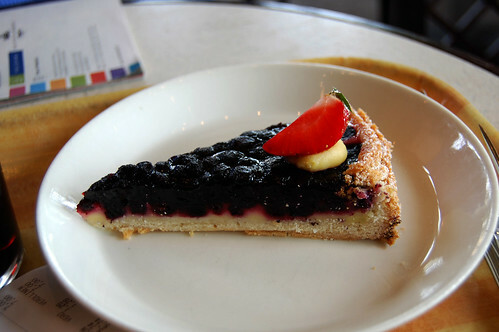 We settled for a modest slice of blueberry tart on that first visit (yes, there was a second), a tart that was surprisingly not very sweet. We returned there the next day, on Sunday, after a visit to Suomenlinna, and this time had a slice of much sweeter Daim cake, a chocolate and toffee confection made with the Swedish sweet of the same name. What really drew us back was the setting and atmosphere of the cafe. With its large glass panels and central location, there’s a lot of people watching that can be done. The seats are plush and there’s plenty of natural light and there’s lovely music playing in the background. We must have spent a few hours in there! 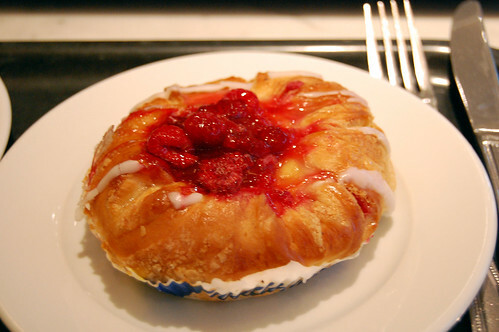 and a sweet bun topped with raspberries. 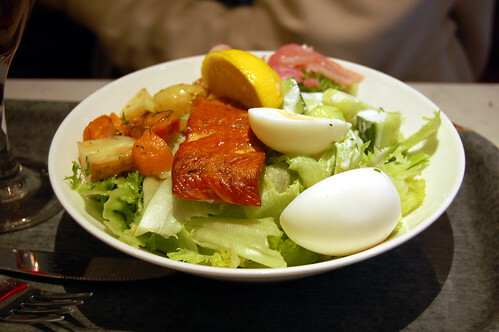 We had a choice of dressings with the salad – yogurt and herb or mango and chili. We chose the former but the latter must be popular in Helsinki as we saw it offered at other places. The food was delicious and I wish we had space to try their beautiful cakes. 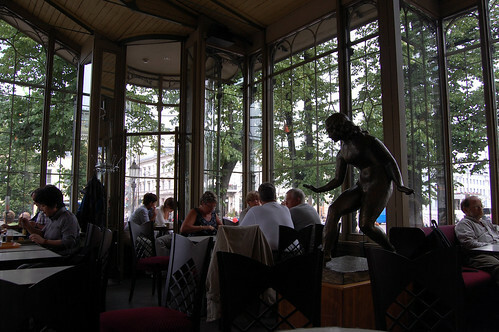 Seating inside was so-so and cannot beat that of Café Kappeli but they have outdoor seating that reminds one of Paris. Another upside is that it’s open in the evenings, when many other cafes close. 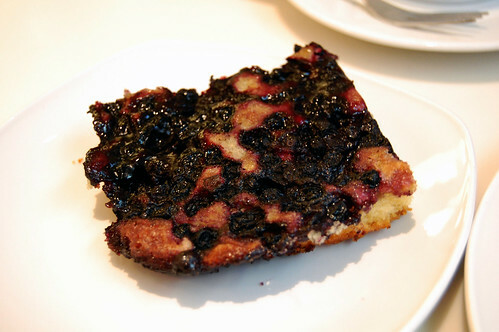 and a slice of blueberry cake (similar to a coffee cake and it’s so delicious). 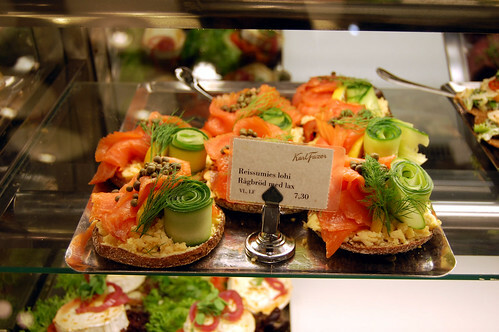 So, if you ever are in Helsinki, do make time to relax and eat at one of its many cafés. It’s all part of the culture here and isn’t experiencing that the best part of travelling? All my Helsinki photos can be found in this Flickr photoset. After a long first day wandering the streets of Helsinki, we started looking for a nice place to have dinner. After passing on many restaurants (so expensive! ), we wanted to try Strindberg but on a Saturday night, they were totally full and wait would have been one or two hours. (We actually tried to return on Sunday night but they were closed!) After a disastrous attempt to get into an Italian restaurant and my putting my foot down at a restaurant that served Finnish, French and Asian food, we just decided to go to this centrally located steakhouse, Baker’s. At first, I thought this was some kind of chain, what with the cartoony cow logo and the huge building, but the building was made up of a bar, a cafe and the restaurant upstairs (this seems to be the norm in Helsinki). And I’m not sure as I cannot read Finnish but there may be a sauna there too! When I saw reindeer on the menu, I knew I had to try it! 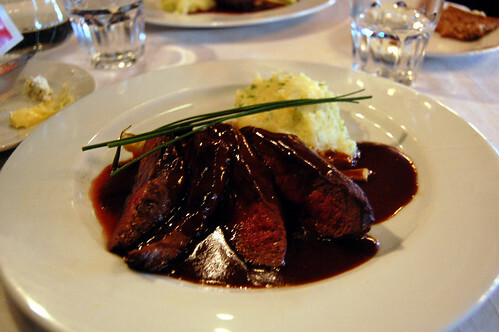 It was listed on the menu as roast reindeer, Baker´s seasoned butter sauce flavoured with vodka, potato mash with herbs. We both ordered it too! After taking our orders, our waiter directed our attention to the bread buffet – yes, a bread buffet! Is this a typical thing in Finland? We had quite a bit of the tasty brown bread and the flat rye rolls (these had a pleasant natural sweetness to them) and the accompanying soft butter and soft white cheese with plenty of those red peppercorns on top. After perhaps a little too much bread, our reindeer arrived. This was my plate. Now what was strange is that while my plate had a normal sized portion of reindeer sliced into four, poor Blai received a much smaller piece sliced in two. Oh, how forlornly he looked at my plate! I gave him one of my pieces and we were again on equal footing! The reindeer was gamey as one would expect but the iron flavour was very subtle. The meat was lean and superbly tender (we had it cooked to medium). The accompanying sauce was just delicious and we used the mash to wipe up every last bit. 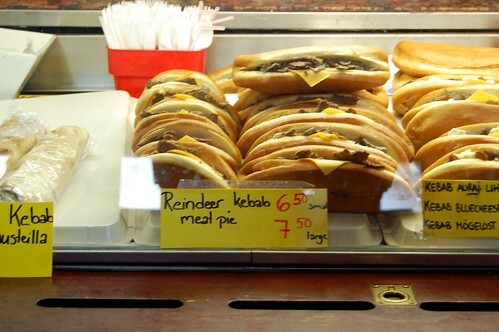 Reindeer is a meat I wouldn’t mind eating again! 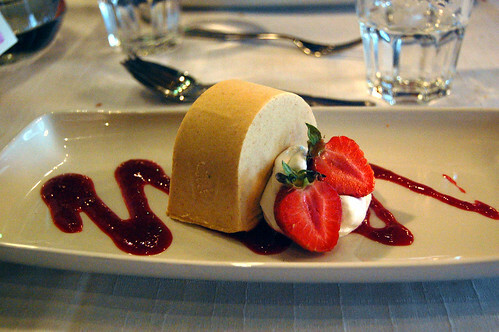 while I chose the cloudberry vanilla parfait and melba sauce. 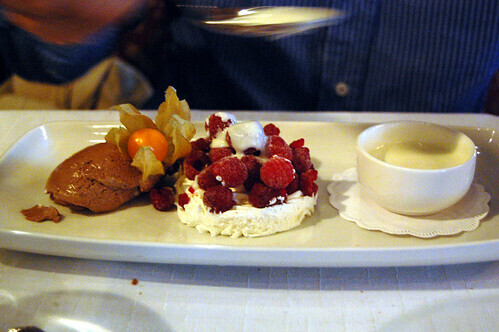 What really struck me about the desserts were how unsweet they were, something I had noticed with a blueberry tart we’d had in a cafe earlier that afternoon. Even the chocolate mousse had barely any sugar in it, making it for one of the most cocoa rich mousses I’d ever tasted. 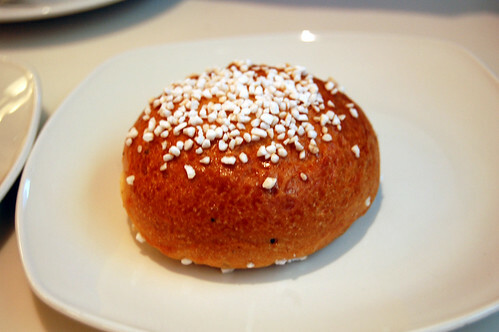 Is this a typically Finnish dessert trait? I chose my dessert as I wanted to try the famous Scandinavian/Finnish cloudberry and it’s flavour wasn’t exactly what I was expecting! Don’t get me wrong – it’s not unpleasant but I think I was expecting something akin to a raspberry. Instead, it’s… well, it’s hard to describe but I would say it’s almost like a mixture of tropical fruits. If you want to try them, the Ikeas in the UK sell cloudberry jam. The whipped cream in our desserts (under the berries and decorating my parfait) had a strange powdery texture and again, it was unsweetened – I chose to just leave mine on the side. We left full and content; I felt that we’d stumbled onto a gem of a place. It wasn’t a cheap restaurant but I felt that the quality of the food was consistent with the price (read: I didn’t feel ripped off). So, lesson learnt: if there’s a particular restaurant you want to visit, book it! If not, it doesn’t matter, you might end up discovering a great place. I’ve just spent a long weekend in Helsinki with Blai; he was there for a course and I flew in to join him on Friday night. We had a lovely relaxing time but goodness, if one thing’s for sure, it’s that Helsinki is one expensive city. 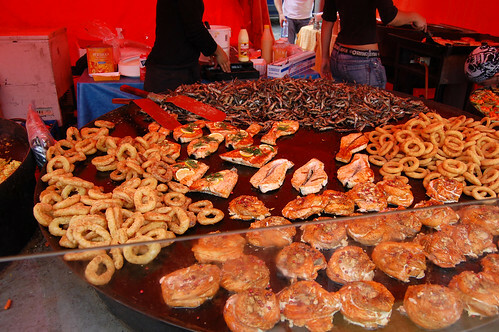 An average restaurant sells main courses for around 20€ and to eat anywhere cheaper, you’d be eating ethnic food. And I didn’t go all the way to Helsinki to eat Chinese food (though there was a cheap pizza or two – there are so many pizza places in Helsinki!)! Anyway, it was a fun weekend away, with much of our time spent at a few of Helsinki’s many cafes. My penchant for street food led us to the Kauppatori (the market square by the harbour) on Saturday morning where I’d heard that there would be many stalls selling little bites. We saw many produce vendors selling many root vegetables, beans, peas in their pods, apricots, cherries, black and redcurrants and many many berries. June to August is the season for berries and here there were all kinds: strawberries, raspberries, blackberries, and the celebrated cloudberry. 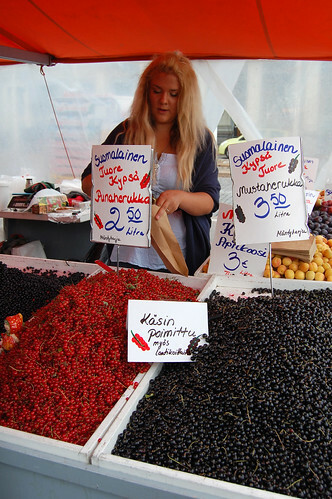 We purchased a litre of peas and proceeded to shell them and eat them raw, Finnish style, while we wandered the stalls. Helsinki is expensive and so we skipped most of the stalls selling traditional Scandinavian goods. I don’t really need a plain 5€ wooden butter “knife” nor do I require a reindeer hide (though it was tempting); I was more interested in the food! There were a few outdoor cafes selling baked goods and coffee and even more featuring huge pans with fresh seafood or reindeer meat. 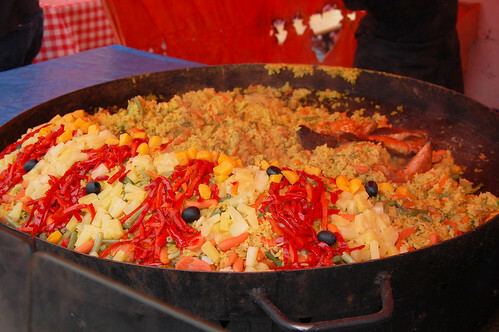 Bizarrely, “paella” featured at almost every stall. We also spent some time in the Kauppahalli, the market hall housed in a wooden building, also next to the harbour, and marvelled at the range of sandwiches and seafood salads available inside. However, the allure of the hot seafood outside caused us to not even consider these. We went back outside and went to the stall that appealed to us most. We chose a selection of the seafood which confused the man helping us as to how much he should charge us (keep in mind that I did ask whether we could have a bit of this and a bit of that!). Normally, you see, you choose one of the seafood items and it’s paired with vegetables and rice or potatoes for about 9€. As we were not starving, thanks to the lovely breakfast at our hotel, we wanted to sample a few things. 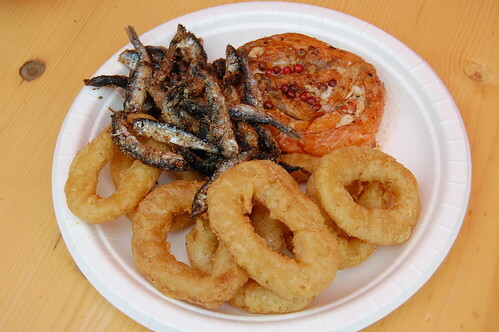 In the end, he ended up charging us 10€ for the salmon roll with blue cheese and rose peppercorns (these red peppercorns are very popular in Helsinki), fried calamari rings, and little fried whitebait-like fish. I think we got a real bargain! Everything was extremely fresh and not at all greasy; the only oil coming out of it was that from the salmon and blue cheese. The salmon was delicious, despite my not being a fan of blue cheese, and the calamari was thick and tender. The small fish were highly poppable and between the two of us, pop we did. 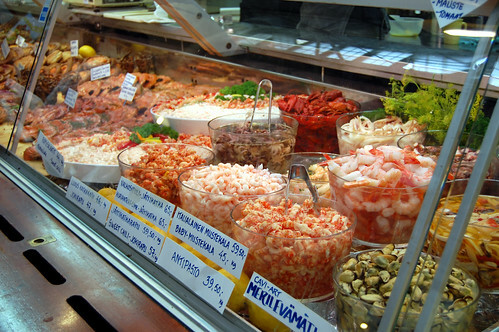 If you’re in Helsinki, I highly recommend a visit there, especially for an affordable lunch. While my guidebook said that the market closes at about 3pm each day and is closed on Sunday, I found that opening times change for the summer (this doesn’t just apply to the market – we found that reception opening times also changed for our hotel). All the stalls were open even on a Sunday until 6pm. It might be worth it to check with the tourist office.